This article is about the shape and mathematical concept. For other uses, see Circle (disambiguation). "360 degrees" and "360°" redirect here. For other uses, see 360 degrees (disambiguation). A circle is a simple closed shape. It is the set of all points in a plane that are at a given distance from a given point, the centre; equivalently it is the curve traced out by a point that moves in a plane so that its distance from a given point is constant. The distance between any of the points and the centre is called the radius. This article is about circles in Euclidean geometry, and, in particular, the Euclidean plane, except where otherwise noted. A circle is a simple closed curve that divides the plane into two regions: an interior and an exterior. In everyday use, the term "circle" may be used interchangeably to refer to either the boundary of the figure, or to the whole figure including its interior; in strict technical usage, the circle is only the boundary and the whole figure is called a disc. A circle may also be defined as a special kind of ellipse in which the two foci are coincident and the eccentricity is 0, or the two-dimensional shape enclosing the most area per unit perimeter squared, using calculus of variations. A circle is a plane figure bounded by one line, and such that all right lines drawn from a certain point within it to the bounding line, are equal. The bounding line is called its circumference and the point, its centre. Annulus: a ring-shaped object, the region bounded by two concentric circles. Arc: any connected part of a circle. Specifying two end points of an arc and a center allows for two arcs that together make up a full circle. Centre: the point equidistant from all points on the circle. Chord: a line segment whose endpoints lie on the circle, thus dividing a circle in two sements. Circumference: the length of one circuit along the circle, or the distance around the circle. Diameter: a line segment whose endpoints lie on the circle and that passes through the centre; or the length of such a line segment. This is the largest distance between any two points on the circle. It is a special case of a chord, namely the longest chord for a given circle, and its length is twice the length of a radius. Disc: the region of the plane bounded by a circle. Lens: the region common to (the intersection of) two overlapping discs. Passant: a coplanar straight line that has no point in common with the circle. Radius: a line segment joining the centre of a circle with any single point on the circle itself; or the length of such a segment, which is half (the length of) a diameter. Sector: a region bounded by two radii of equal length with a common center and either of the two possible arcs, determined by this center and the endpoints of the radii. Segment: a region bounded by a chord and one of the arcs connecting the chord's endpoints. The length of the chord imposes a lower boundary on the diameter of possible arcs. Sometimes the term segment is used only for regions not containing the center of the circle to which their arc belongs to. Secant: an extended chord, a coplanar straight line, intersecting a circle in two points. Semicircle: one of the two possible arcs determined by the endpoints of a diameter, taking its midpoint as center. In non-technical common usage it may mean the interior of the two dimensional region bounded by a diameter and one of its arcs, that is technically called a half-disc. A half-disc is a special case of a segment, namely the largest one. Tangent: a coplanar straight line that has one single point in common with a circle ("touches the circle at this point"). All of the specified regions may be considered as open, that is, not containing their boundaries, or as closed, including their respective boundaries. 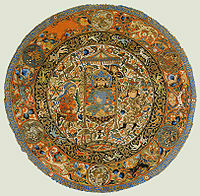 The compass in this 13th-century manuscript is a symbol of God's act of Creation. Notice also the circular shape of the halo. The word circle derives from the Greek κίρκος/κύκλος (kirkos/kuklos), itself a metathesis of the Homeric Greek κρίκος (krikos), meaning "hoop" or "ring". The origins of the words circus and circuit are closely related. 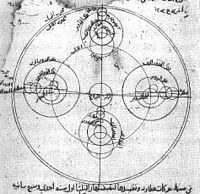 Circles in an old Arabic astronomical drawing. The circle has been known since before the beginning of recorded history. Natural circles would have been observed, such as the Moon, Sun, and a short plant stalk blowing in the wind on sand, which forms a circle shape in the sand. The circle is the basis for the wheel, which, with related inventions such as gears, makes much of modern machinery possible. In mathematics, the study of the circle has helped inspire the development of geometry, astronomy and calculus. 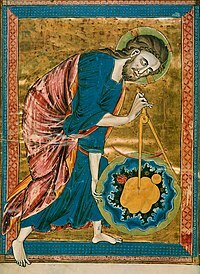 Early science, particularly geometry and astrology and astronomy, was connected to the divine for most medieval scholars, and many believed that there was something intrinsically "divine" or "perfect" that could be found in circles. 1700 BCE – The Rhind papyrus gives a method to find the area of a circular field. The result corresponds to 256/81 (3.16049...) as an approximate value of π. 300 BCE – Book 3 of Euclid's Elements deals with the properties of circles. In Plato's Seventh Letter there is a detailed definition and explanation of the circle. Plato explains the perfect circle, and how it is different from any drawing, words, definition or explanation. 1880 CE – Lindemann proves that π is transcendental, effectively settling the millennia-old problem of squaring the circle. that is, approximately 79% of the circumscribing square (whose side is of length d). The circle is the plane curve enclosing the maximum area for a given arc length. This relates the circle to a problem in the calculus of variations, namely the isoperimetric inequality. where t is a parametric variable in the range 0 to 2π, interpreted geometrically as the angle that the ray from (a, b) to (x, y) makes with the positive x-axis. In this parameterisation, the ratio of t to r can be interpreted geometrically as the stereographic projection of the line passing through the centre parallel to the x-axis (see Tangent half-angle substitution). However, this parameterisation works only if t is made to range not only through all reals but also to a point at infinity; otherwise, the bottom-most point of the circle would be omitted. It can be proven that a conic section is a circle exactly when it contains (when extended to the complex projective plane) the points I(1: i: 0) and J(1: −i: 0). These points are called the circular points at infinity. Note that without the ± sign, the equation would in some cases describe only half a circle.
. Not all generalised circles are actually circles: a generalised circle is either a (true) circle or a line. This can also be found using implicit differentiation. The circle is a highly symmetric shape: every line through the centre forms a line of reflection symmetry and it has rotational symmetry around the centre for every angle. Its symmetry group is the orthogonal group O(2,R). The group of rotations alone is the circle group T.
A circle's circumference and radius are proportional. The area enclosed and the square of its radius are proportional. The constants of proportionality are 2π and π, respectively. The circle that is centred at the origin with radius 1 is called the unit circle. Thought of as a great circle of the unit sphere, it becomes the Riemannian circle. Through any three points, not all on the same line, there lies a unique circle. In Cartesian coordinates, it is possible to give explicit formulae for the coordinates of the centre of the circle and the radius in terms of the coordinates of the three given points. 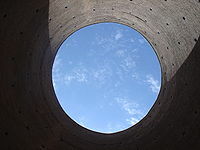 See circumcircle. Chords are equidistant from the centre of a circle if and only if they are equal in length. A perpendicular line from the centre of a circle bisects the chord. The line segment through the centre bisecting a chord is perpendicular to the chord. If two angles are inscribed on the same chord and on the same side of the chord, then they are equal. If two angles are inscribed on the same chord and on opposite sides of the chord, then they are supplementary. An inscribed angle subtended by a diameter is a right angle (see Thales' theorem). The diameter is the longest chord of the circle. Among all the circles with a chord AB in common, the circle with minimal radius is the one with diameter AB. If the intersection of any two chords divides one chord into lengths a and b and divides the other chord into lengths c and d, then ab = cd. The sum of the squared lengths of any two chords intersecting at right angles at a given point is the same as that of any other two perpendicular chords intersecting at the same point, and is given by 8r 2 – 4p 2 (where r is the circle's radius and p is the distance from the centre point to the point of intersection). A line drawn perpendicular to a radius through the end point of the radius lying on the circle is a tangent to the circle. A line drawn perpendicular to a tangent through the point of contact with a circle passes through the centre of the circle. Two tangents can always be drawn to a circle from any point outside the circle, and these tangents are equal in length. If a tangent at A and a tangent at B intersect at the exterior point P, then denoting the centre as O, the angles ∠BOA and ∠BPA are supplementary. If AD is tangent to the circle at A and if AQ is a chord of the circle, then ∠DAQ = 1/2arc(AQ). The chord theorem states that if two chords, CD and EB, intersect at A, then AC × AD = AB × AE. The angle between a chord and the tangent at one of its endpoints is equal to one half the angle subtended at the centre of the circle, on the opposite side of the chord (Tangent Chord Angle). If the angle subtended by the chord at the centre is 90 degrees then ℓ = r √2, where ℓ is the length of the chord and r is the radius of the circle. where O is the centre of the circle. This is the secant-secant theorem. 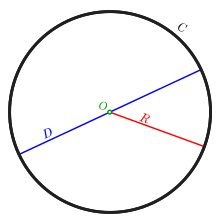 An inscribed angle (examples are the blue and green angles in the figure) is exactly half the corresponding central angle (red). Hence, all inscribed angles that subtend the same arc (pink) are equal. Angles inscribed on the arc (brown) are supplementary. In particular, every inscribed angle that subtends a diameter is a right angle (since the central angle is 180 degrees). The sagitta is the vertical segment. The sagitta (also known as the versine) is a line segment drawn perpendicular to a chord, between the midpoint of that chord and the arc of the circle. Another proof of this result, which relies only on two chord properties given above, is as follows. Given a chord of length y and with sagitta of length x, since the sagitta intersects the midpoint of the chord, we know it is part of a diameter of the circle. Since the diameter is twice the radius, the "missing" part of the diameter is (2r − x) in length. Using the fact that one part of one chord times the other part is equal to the same product taken along a chord intersecting the first chord, we find that (2r − x)x = (y / 2)2. Solving for r, we find the required result. There are many compass-and-straightedge constructions resulting in circles. The simplest and most basic is the construction given the centre of the circle and a point on the circle. Place the fixed leg of the compass on the centre point, the movable leg on the point on the circle and rotate the compass. 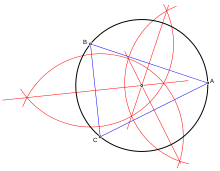 Construct the midpoint M of the diameter. Construct the circle with centre M passing through one of the endpoints of the diameter (it will also pass through the other endpoint). Construct a circle through points A, B and C by finding the perpendicular bisectors (red) of the sides of the triangle (blue). Only two of the three bisectors are needed to find the centre. Construct the perpendicular bisector of the segment PQ. Construct the perpendicular bisector of the segment PR. Label the point of intersection of these two perpendicular bisectors M. (They meet because the points are not collinear). Construct the circle with centre M passing through one of the points P, Q or R (it will also pass through the other two points). Apollonius of Perga showed that a circle may also be defined as the set of points in a plane having a constant ratio (other than 1) of distances to two fixed foci, A and B. (The set of points where the distances are equal is the perpendicular bisector of segment AB, a line.) That circle is sometimes said to be drawn about two points. Analogously, a line segment PD through some point D on AB extended bisects the corresponding exterior angle BPQ where Q is on AP extended. Since the interior and exterior angles sum to 180 degrees, the angle CPD is exactly 90 degrees, i.e., a right angle. 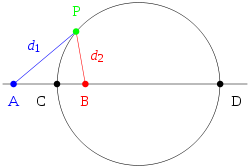 The set of points P such that angle CPD is a right angle forms a circle, of which CD is a diameter. Second, see:p.15 for a proof that every point on the indicated circle satisfies the given ratio. 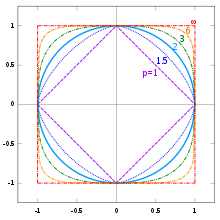 Stated another way, P is a point on the circle of Apollonius if and only if the cross-ratio [A,B;C,P] is on the unit circle in the complex plane. is not a circle, but rather a line. Thus, if A, B, and C are given distinct points in the plane, then the locus of points P satisfying the above equation is called a "generalised circle." It may either be a true circle or a line. In this sense a line is a generalised circle of infinite radius. In every triangle a unique circle, called the incircle, can be inscribed such that it is tangent to each of the three sides of the triangle. 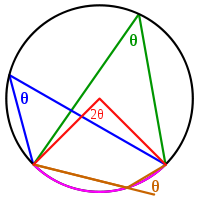 About every triangle a unique circle, called the circumcircle, can be circumscribed such that it goes through each of the triangle's three vertices. A tangential polygon, such as a tangential quadrilateral, is any convex polygon within which a circle can be inscribed that is tangent to each side of the polygon. Every regular polygon and every triangle is a tangential polygon. A cyclic polygon is any convex polygon about which a circle can be circumscribed, passing through each vertex. A well-studied example is the cyclic quadrilateral. Every regular polygon and every triangle is a cyclic polygon. A polygon that is both cyclic and tangential is called a bicentric polygon. A hypocycloid is a curve that is inscribed in a given circle by tracing a fixed point on a smaller circle that rolls within and tangent to the given circle. A Cartesian oval is a set of points such that a weighted sum of the distances from any of its points to two fixed points (foci) is a constant. An ellipse is the case in which the weights are equal. A circle is an ellipse with an eccentricity of zero, meaning that the two foci coincide with each other as the centre of the circle. A circle is also a different special case of a Cartesian oval in which one of the weights is zero. for positive a, b, and n. A supercircle has b = a. A circle is the special case of a supercircle in which n = 2. A Cassini oval is a set of points such that the product of the distances from any of its points to two fixed points is a constant. When the two fixed points coincide, a circle results. A curve of constant width is a figure whose width, defined as the perpendicular distance between two distinct parallel lines each intersecting its boundary in a single point, is the same regardless of the direction of those two parallel lines. The circle is the simplest example of this type of figure. 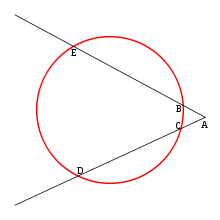 A circle of radius 1 (using this distance) is the von Neumann neighborhood of its center. 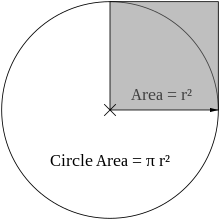 A circle of radius r for the Chebyshev distance (L∞ metric) on a plane is also a square with side length 2r parallel to the coordinate axes, so planar Chebyshev distance can be viewed as equivalent by rotation and scaling to planar taxicab distance. However, this equivalence between L1 and L∞ metrics does not generalize to higher dimensions. Squaring the circle is the problem, proposed by ancient geometers, of constructing a square with the same area as a given circle by using only a finite number of steps with compass and straightedge. In 1882, the task was proven to be impossible, as a consequence of the Lindemann–Weierstrass theorem, which proves that pi (π) is a transcendental number, rather than an algebraic irrational number; that is, it is not the root of any polynomial with rational coefficients. ^ Proclus, The Six Books of Proclus, the Platonic Successor, on the Theology of Plato Archived 2017-01-23 at the Wayback Machine Tr. Thomas Taylor (1816) Vol. 2, Ch. 2, "Of Plato"
^ Chronology for 30000 BC to 500 BC Archived 2008-03-22 at the Wayback Machine. History.mcs.st-andrews.ac.uk. Retrieved on 2012-05-03. ^ Squaring the circle Archived 2008-06-24 at the Wayback Machine. History.mcs.st-andrews.ac.uk. Retrieved on 2012-05-03. ^ Posamentier and Salkind, Challenging Problems in Geometry, Dover, 2nd edition, 1996: pp. 104–105, #4–23. ^ College Mathematics Journal 29(4), September 1998, p. 331, problem 635. ^ Johnson, Roger A., Advanced Euclidean Geometry, Dover Publ., 2007. ^ Ogilvy, C. Stanley, Excursions in Geometry, Dover, 1969, 14–17. ^ Altshiller-Court, Nathan, College Geometry, Dover, 2007 (orig. 1952). ^ Incircle – from Wolfram MathWorld Archived 2012-01-21 at the Wayback Machine. Mathworld.wolfram.com (2012-04-26). Retrieved on 2012-05-03. ^ Circumcircle – from Wolfram MathWorld Archived 2012-01-20 at the Wayback Machine. Mathworld.wolfram.com (2012-04-26). Retrieved on 2012-05-03. ^ Tangential Polygon – from Wolfram MathWorld Archived 2013-09-03 at the Wayback Machine. Mathworld.wolfram.com (2012-04-26). Retrieved on 2012-05-03. Pedoe, Dan (1988). Geometry: a comprehensive course. Dover. Wikisource has the text of the 1911 Encyclopædia Britannica article Circle. Weisstein, Eric W. "Circle". MathWorld. Interactive Java applets for the properties of and elementary constructions involving circles.